Michigan is beautiful in the winter — a true sight to behold. It’s also cold. Very cold. The average annual temperature around our Boyne Falls mill is only 46 degrees, and our average yearly snowfall total tops 100 inches. (Source: U.S. Climate Data) Thankfully, inside our mill it’s toasty — and you might be surprised to learn what’s keeping us warm. We have two custom-designed Equilibrium Moisture Content (EMC) kilns, each heated by natural gas and capable of drying approximately 70,000 BD FT of wood building material. These mills create steam, which we pipe underground and use to heat our production facilities during the winter months. This process is a way we keep utility costs down — a savings that we then pass on to our customers. This isn’t the only way you benefit, though. 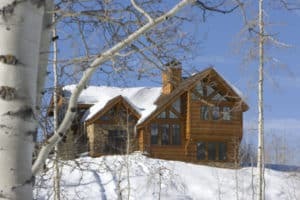 Kiln-drying not only keeps us warm and cuts costs, it also ensures that we produce the highest-quality log siding, log paneling and other wood building products available. In fact, we will not ship our finished products without first kiln-drying them to a specific EMC point, or the point at which wood no longer gains or loses moisture. This is typically between 6 and 11 percent. Even though this process can take up to three weeks, we believe it’s not only worth the extra time, but also necessary to the integrity of our finished products. As wood dries, it naturally checks, shrinks and warps. Any voids in log siding created by these defects become havens for rot and decay. In some cases, cracks can jeopardize a log’s structural integrity and load-bearing capability — something you never want to happen in a truss. By drying wood under controlled conditions in our kiln, we can reduce the severity of defects that occur and correct them, rather than letting them occur naturally on a home after installation. Because we are one of the few companies that produce all of our own log siding from the logs coming out of the forests that surround our mill in Michigan, then saw, kiln dry and finally mold and end match finished products in one facility, we are able to ensure that the log siding and tongue & groove paneling and other wood products that you use for your project are of the finest quality available. It also ensures you pay mill direct pricing that in most cases is far less then what you will pay form the big box retailers in your local area. Bark is carefully stripped and reused for landscaping projects. Smaller limbs and twigs are saved and repurposed into railings. Saw dust is collected in our silo and used for horse and dog bedding as well as heating pellets. It’s the perfect material, since White Cedar naturally repels pests such as fleas and ticks. We welcome visitors to tour our Boyne Falls mill year-round. Stop by this winter, and we can assure you that you’ll stay warm and toasty thanks to our EMC kilns. Now is an especially exciting time to schedule your visit. Check out our brand-new, technologically advanced saw and grade resaw system. This new installment is helping us increase the production of our wood building products to 35,000 BD daily — making Heartwood Mills one of only a few wood materials and specialty products manufacturers with that capability.